Head to Cornwall this Easter for a fun-filled family holiday and join in with the many activities on offer around the county. Trereife House, near Penzance will be hosting its own Easter Fair from Friday 6 to Monday 9 April 2012. There will be inspiring tours of the house, a delectable selection of locally produced food and drink, arts and crafts, children’s Easter Egg hunts, live music performances and cookery demonstrations from local restaurants and chefs. Located on Higher Trewellard Hill Farm in St Just, a UNESCO World Heritage Site, this delightful character cottage occupies one wing of a previously working farmhouse. Quiet and isolated, the cottage has superb views of the north coast and moors and provides a comfortable and welcoming stay for up to 4 guests (children over 5 only). A stay from 31 March 2012 – 07 April 2012 is £359.10 down from £399. Spot the signs of spring and learn about gardening at Trelissick, near Truro from 31 March to 15 April 2012. A reward will be handed out on completion of the fun-packed Easter trail. There will also be a big Easter Egg Hunt with Cadbury’s Play and face painting on 8 and 9 April 2012.
kj Sunlight Cottage is centrally located in a peaceful and secluded setting just north of Truro. Occupying the entire ground floor of a traditional converted agricultural building, it provides a high standard of accommodation for up to 4 people with modern open plan fitted kitchen and living room area and two bedrooms. A stay from 07 April 2012 – 14 April 2012 is £314.10 down from £349. Discover exploding plants, sticky plants, smelly plants and even carnivorous plants that bite back at the Eden Project’s Freaky Nature Easter holiday activity that runs from 31 March to 15 April 2012. Glenleigh Cottage is a superb stone barn conversion in a rural position near St Austell. Spacious and very well equipped, there is an open plan kitchen, dining and living space with vaulted beamed ceiling and two bedrooms. There is also a well-stocked lake for those who like to fish, included with any booking. A stay from 01 April 2012 – 05 April 2012 is £262.64 down from £262.64. Crack the clues to complete the ‘egg-citing’ trails at Pendennis Castle in Falmouth and Tintagel Castle from 31 March to 15 April 2012. Find the missing eggs to be rewarded with a yummy Easter prize. 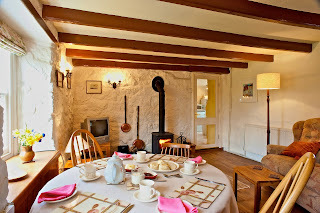 The Old Chapel in Tintagel is a very quirky place to stay for up to 8 guests. Perfect for groups, there is plenty of space as well as a large dining table, loads of comfy sofas and activities to keep everyone entertained including table football and mini snooker table. A stay from 31 March 2012 – 07 April 2012 is £629.10 down from £699. 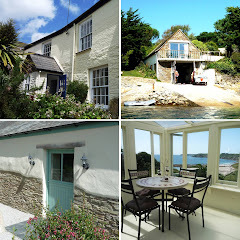 Just a short trip by boat from Falmouth is Number Eleven, located in the picturesque harbour town of St Mawes. Sleeping up to 6 guests in three bedrooms, this immaculately presented luxury Cottage has superb sea views from the balcony, dining room and both sitting rooms. A stay from 30 March 2012 – 06 April 2012 is £854.10 down from £949.